I live in Jersey City, just across the river from NYC. After living in NYC for a little over 15 years, Jersey City (JC) was a difficult move. It had to be done, of course. We’d been living in Brooklyn and once I got accepted to Rutgers University in New Brunswick, NJ, we knew the commute would be too much, particularly without a car. JC was our choice based on proximity to NYC and Rutgers. In truth, my commute is pretty long (about 1 hr 35 min on average, but it can be as long as 2 hrs each way), but it would have been longer if we’d stayed in Brooklyn. ‘We’ refers to my partner and me. Ciprian. I talk about him a lot. Many of you (most of you?) know him. In any event, why am I discussing this on my travel blog? Because I like to think of our move to JC as an extended living-abroad experience. I do not mean to suggest that Jersey is a foreign country, only that the move is temporary for us, and that it is different enough from NYC to feel sometimes as if we are indeed living abroad. This may be more true for me than for Ciprian. 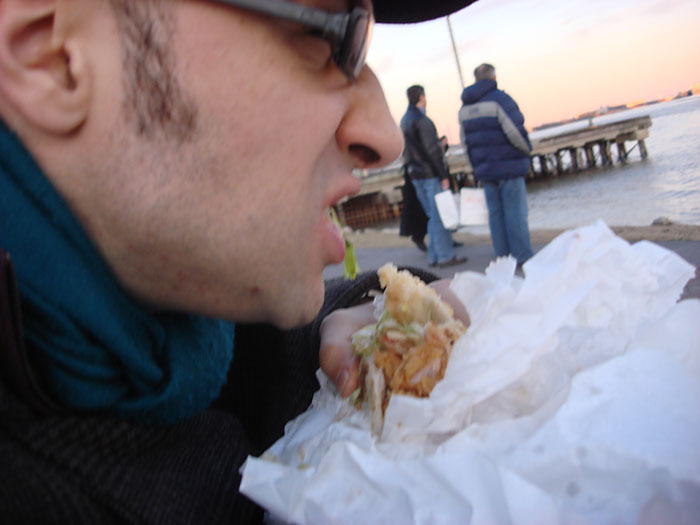 He works in Manhattan and rarely spends much time in JC or anywhere else in Jersey. I, on the other hand, go deeper into the state at least 4 days a week, more often 5, and am far enough away from NYC that it feels like a completely different place. There are aspects of this that I like. New Brunswick has its charm and the Rutgers campus that I spend most of my time on, the Douglass campus, is really quite lovely. There are massive old pines that have been permanently bent from years of heavy winds. There are even wild animals in New Brunswick (and sometimes in JC for that matter). I’ve seen raccoons, skunks, lots of geese, and deer all on the Rutgers campuses. Not exactly bears and bobcats, but wildlife nonetheless. Also, it is quiet in New Brunswick, or as quiet as a college campus can be, but relative to NYC, it is serene. This has its drawbacks at times, such as when I have to go in on a weekend. It can be a little too quiet in my small corner of the Biological Sciences building, particularly since I have no windows, but for the most part I like the quiet. JC is probably more like NYC than like New Brunswick, but I have not yet figured it out. I mean that I don’t understand JC. JC is segmented and lacks a sense of community pride, something that is ever present in NYC and in many other cities I’ve visited (such as New Orleans). It appears to be a random scatter of lower, middle and upper middle class families living next door to extremely poor and out-of-work families, with pockets of immigrants from Egypt, Vietnam and Senegal, among other places, gorgeous old Victorian buildings and homes, many of which have been superbly refurbished, nestled in between dilapidated apartment houses with obvious drug deals taking place on the corner, and Park Slope-like gentrification in the rather isolated area around Grove Street. I have never been to the riverfront areas of JC such as Liberty Park and Exchange Place. My suspicion is that they feel more like NYC than JC. The bus service in JC (run by NJ Transit) is decent but difficult to figure out, and includes privately-managed buses such as our own Bergen Avenue line, that are clearly neglected. One gets the sense that the busses are never cleaned or inspected (in fact I just saw one being towed in front of my house). We have a light rail but I have never taken it since it only runs in small sections of the city. We do have a recycling service and reliable trash pick-up, but the streets are frequently scattered with litter and there is a feeling of carelessness that pervades at least our little section of JC. We live near Lincoln Park. I believe it is a county park (Hudson County). It’s nicely laid out but it is not cleaned very often. I wonder if it is due to a lack of funding, too much corruption, lack of organization or some combination. When we lived in Brooklyn, I always noticed how much the community of Sunset Park was involved with the care of its namesake. They had a volunteer program for young people and neighbors who wanted to help keep the park looking good. They frequently mowed the grass and the park sponsored after-school programs for community kids. It’s possible that I live one too many blocks from Lincoln Park to know what really goes on, but my few walks through and by the park have suggested to me that it is not a central piece in our community but that it could be with a little public relations effort. In any event, the park has a large statue of Abe Lincoln at the entrance. It was commissioned by JC’s Lincoln Association. Apparently the association is the first, or one of the first, in the country, organized shortly after the death of Lincoln. I think the park must have been beautiful at one point. There is more to JC than I see on the surface during my walk to and from the PATH train each day. A lot goes on here, and a lot went on in the past, further back than the American Revolution. I am curious to learn more about my temporary home and I’ve decided that I’d like to share what I learn and what I observe. So I’ll be writing a bit in between my travels, as I explore my own home. It will also give me a chance to work on my writing. For starters, I want to talk about the Loews Jersey – a 1920s movie palace on Kennedy Boulevard at Journal Square. 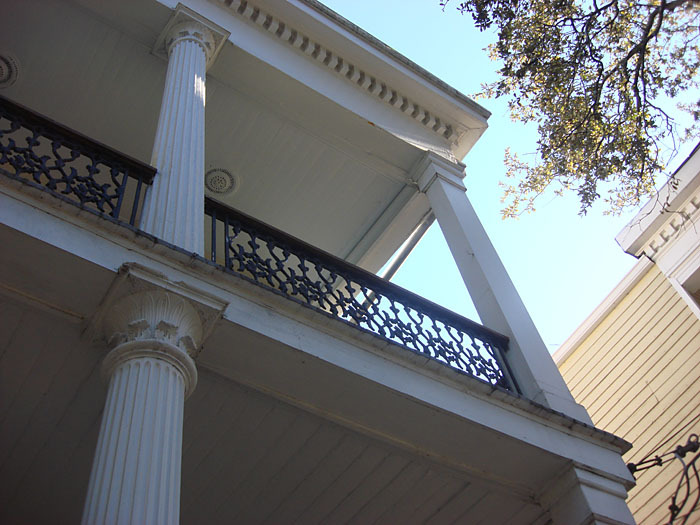 It has been partially refurbished in recent years and is run by a non-profit organization with a volunteer staff. They show movies almost every month and also have some live performances. The orchestra level seating is open, the balcony seating is still being worked on. If I recall correctly, the orchestra has 1500 seats and once the whole place is finished there will be 3000 seats. It is an incredible space. It is large and ornate, with gold detailing covering virtually every inch of the walls and ceilings. Furthermore, the movies they show are primarily old films that no longer show in theaters and they show them for a steal, usually around $6 with $1 for popcorn. It’s a great deal for a fabulous night of entertainment and old movie magic. One of the best parts is the Wonder Organ. Yes, they have an old pipe organ and an organist who plays before and after every show. If you happen to live in JC or nearby, I strongly recommend the Loews Jersey. They’ll be showing The Third Man next month. Any takers? Sometimes you wander around trying to think of stuff to do, taking into consideration time of day, weather, meal options, and so forth, and sometimes you wander into a cool-looking bar and find yourself becoming immersed in the scene. Ciprian and I were hanging out in the French Quarter on Monday. The weather was finally becoming a bit more normal for this part of the world. I think it even got into the upper 40s or lower 50s. 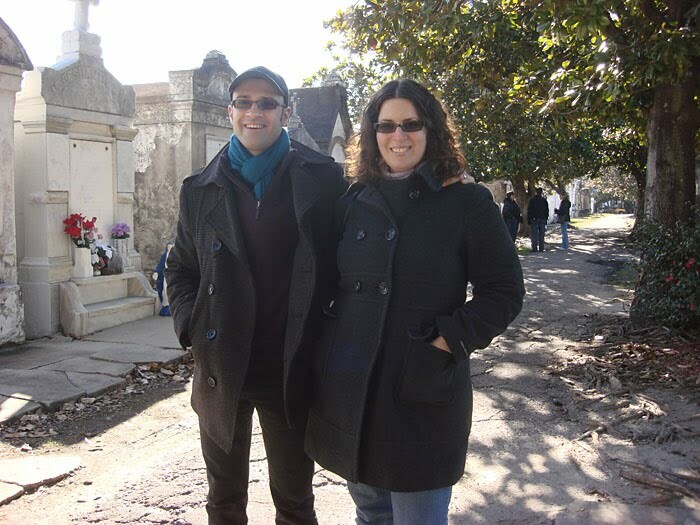 We’d had an awesome tour of Lafayette Cemetery No. 1 earlier in the afternoon with a smart and witty tour guide named Joyce (highly recommended) and we’d just eaten a fantastic fried shrimp po-boy from Verdi-Marte on Royal St. (which apparently never closes and does not have a lock for the door), when we stumbled upon a bar called Pirate’s Alley (sub-name is the Old Absinthe House). It’s a tiny bar with pirate-themed decor on a little street that runs alongside St. Louis Cathedral between Chartres and Royal. We ordered mojitos, then margaritas. The bartender, a young woman named Alicia, is a great conversationalist. We sat at the bar where it turned out there were 3 other tourists from the NY area. There was also a local man named Keith. Keith is a public defender in New Orleans and clearly a regular at the bar. He and Alicia appeared to be old buddies and he was clearly old enough to be her father. Keith had some sausage (I assume it was locally made) that he shared with everyone there, including us. We sat and discussed things like the legal system in Louisiana and the pros and cons of Mardi Gras season. 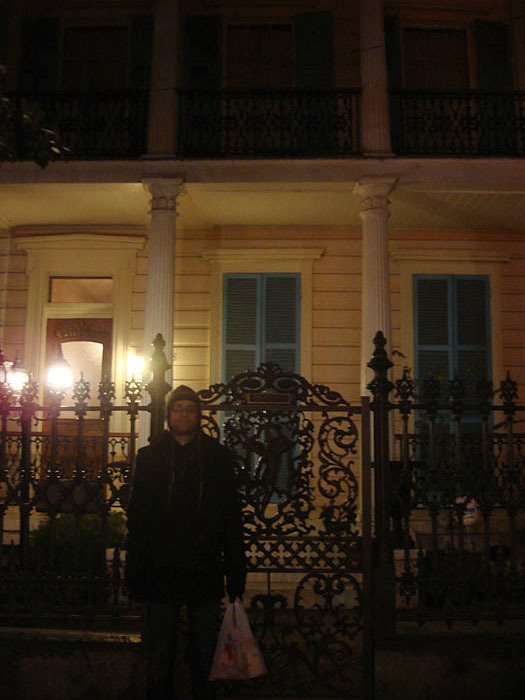 One of the other tourists was very into the haunted tours offered around the French Quarter. I expressed skepticism but did not want to spoil his fun. I did try to restrain myself. 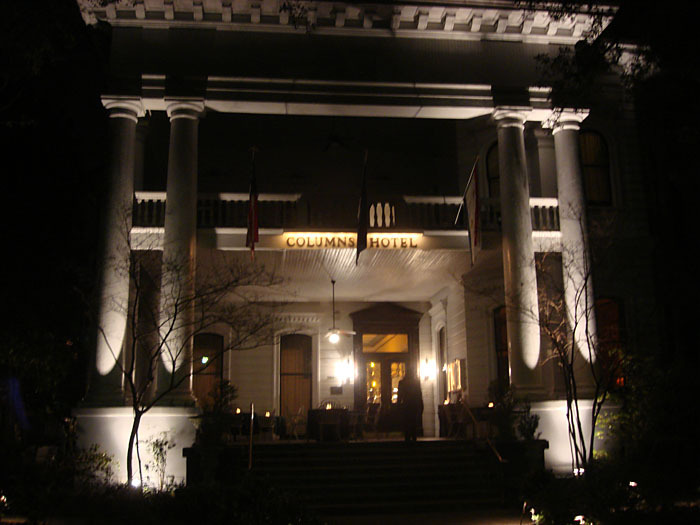 After leaving the pirate bar, we headed back to the Garden District to a place called the Columns Hotel. It is a grand old hotel in the Greek revival architectural tradition with massive columns out front and exquisite wood paneling inside. We’d gone to hear David Doucet play guitar. He is a member of the band Beau Soleil with Michael Doucet. Unfortunately, we were told that he’d had some sort of accident where he’d injured his hand and so there would not be a show that night. We were disappointed, but decided to sit in the bar and have a drink. Once again, sitting in a bar turned into quite an interesting event. There was an older couple to my left who I struck up a conversation with; new to NOLA and eager to share info on great restaurants and music venues. I had a great time talking to them and even exchanged contact info. To Ciprian’s right there was a group of four people in their 40s and 50s with whom he began chatting away. After about an hour, we were being driven by these folk to a sushi restaurant about a mile away to have a late dinner. They “kidnapped” us as they put it, and took us to a sushi place on Magazine St. (Sake Cafe, I think…it was excellent!). Boy were these people a riot; a lawyer, an English professor, a pianist and a former personal assistant to celebrities. We had such fun with them, even if they were a little bit crazy. The next day was Tuesday, our last day in New Orleans. Once again the weather was gorgeous. We got up too late for our B&B breakfast (just like almost every other day) and walked down to Magazine St. to catch the bus to Audubon Park. We were on a mission to go to the zoo! The Audubon Zoo is, of course, part of the Audubon Society, as is the Insectarium, mentioned in my previous post. Audubon is a major presence in New Orleans. I’m not sure of the history. Maybe Mr. Audubon was a New Orleanian? If anyone knows, please share a comment. Audubon Park is big…maybe not as big as Central Park, but pretty damn big. Perhaps the size of Prospect Park, and the zoo itself is a bit smaller than the Bronx Zoo, or that would be my guess anyway. They don’t have as many large herbivores as the Bronx, for which you really need a lot of space. 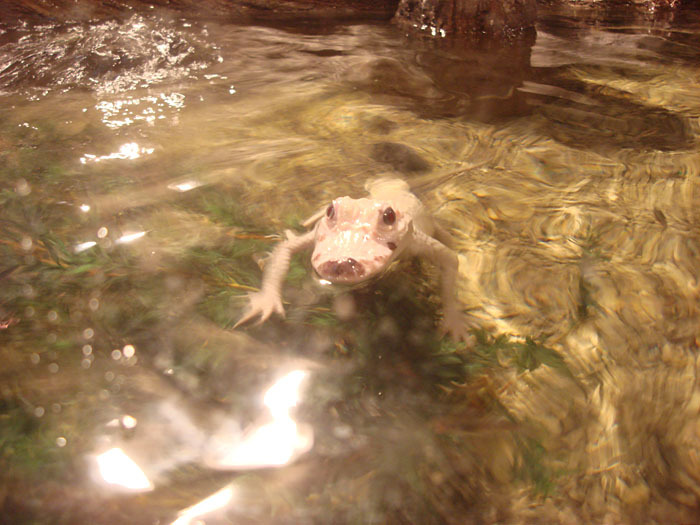 However, they have a fantastic array of animals and a killer swamp exhibit. Highlights for me included the white Bengal tigers, the Asiatic lions, the cougars, the jaguars (okay, ALL of the cats), and the gators…they have two adult white gators and a false gharial (South African gator relative). They also have several foxes and some African Wild dogs. Oh and primates! I almost forgot. Geez. Look at me, yes, I’m an anthropologist. They have siamangs (“lesser apes” from SE Asia), gorillas, orangutans, and lots of different South American and African monkeys including, but not limited to, howlers, dianas, black and whites, tamarins and sakis. 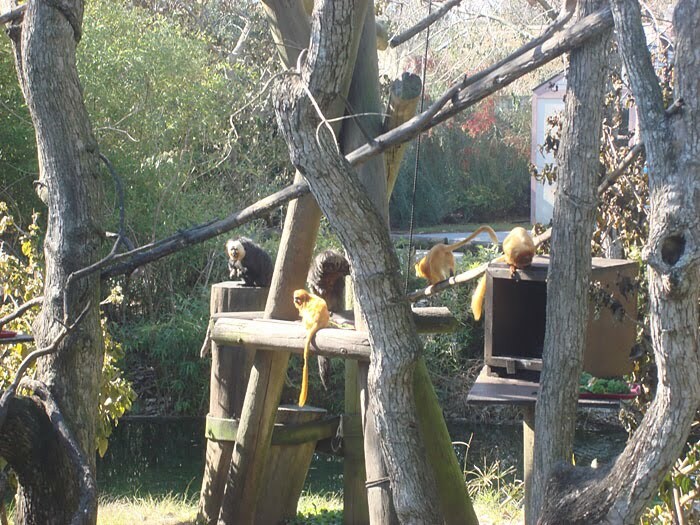 The best part about the primate exhibits is that they are all outside! Benefits of living in the south. Even the tamarins (tiny little monkeys the size of…oh, I don’t know, the size of a kitten) have an outdoor habitat! They share it with two saki monkeys. Really cool. 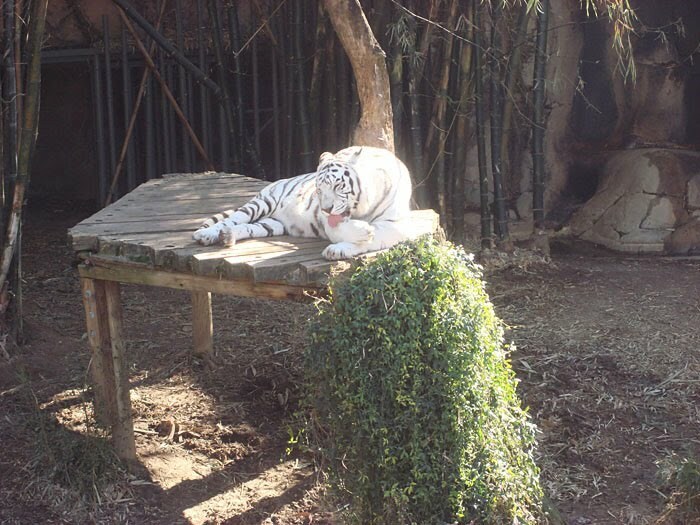 So, the zoo was a big hit with us. We enjoyed it tremendously, plus we had it all to ourselves since it was “cold” out and so hardly anyone was there. Post-zoo, we wandered back down Magazine to find some lunch. We were hoping to go to a place called Guys Po-boys which I’d heard was really good, but we got there a bit late because they’d just closed. We kept on walking and a few blocks later we came upon a place with a short menu in the window. It was just a bakery of sorts with some standard NOLA dishes listed (i.e., gumbo, jambalaya, red beans and rice). We went in and there were three people waiting on their orders. So we waited. We waited about 10 minutes or so before we ordered and during that time, Ciprian looked up the name of the place (Tee Eva’s). Turned out that this place is kind of famous (apparently thanks to Anthony Bourdain) and Ms. Tee Eva herself has gotten quite a lot of attention from the travel industry. We thought, well, there’s no way that Tee Eva is back there doing all the cooking, but sure enough, there she was, a little lady with a whole lot of character and chutzpah. Her husband works there with her. Both are of indeterminate age, I’d say. We ordered a mini crawfish pie, two pralines to go (as gifts), one gumbo and one jambalaya. The jambalaya was fantastic. Probably the best I had in NOLA. Simpler that the version that Coops serves (in terms of the number of ingredients), but really tasty. The gumbo was intense…maybe a little too intense for us. We did not manage to finish it, but I would still recommend Tee Eva’s place. 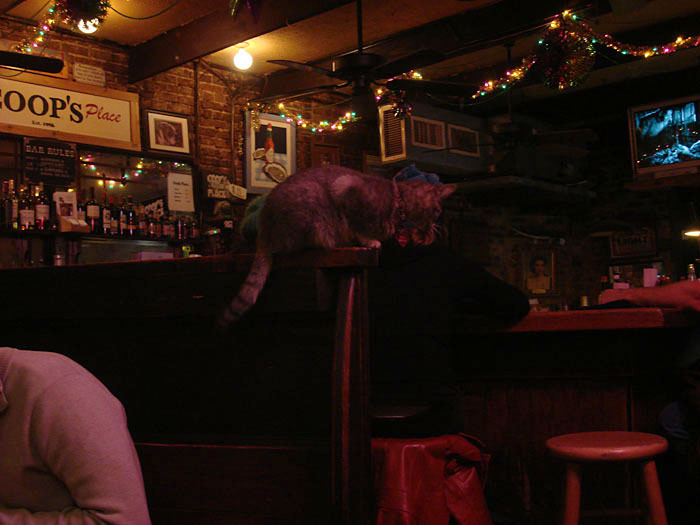 It’s inexpensive and you get a real “taste” for New Orleans…culturally and epicuriously. We ended up hanging out in Tee Eva’s for about an hour. Some other folk came in including a musician and his french lady friend who we chatted up a bit. We ordered a second jambalaya and headed back up to St. Charles for the streetcar. I was on a candy mission – I needed to make it to Southern Candymakers before they closed. I actually had plenty of time and we made it without any trouble. Even had time to pop into an old used book store on Chartres just a block or two off Canal. Southern Candymakers are, in my opinion, probably the best praline makers in the city if not the world (does anyone outside of NOLA even make pralines?). They also make amazing fudge and saltwater taffy. I got several little samples of various sweeties. 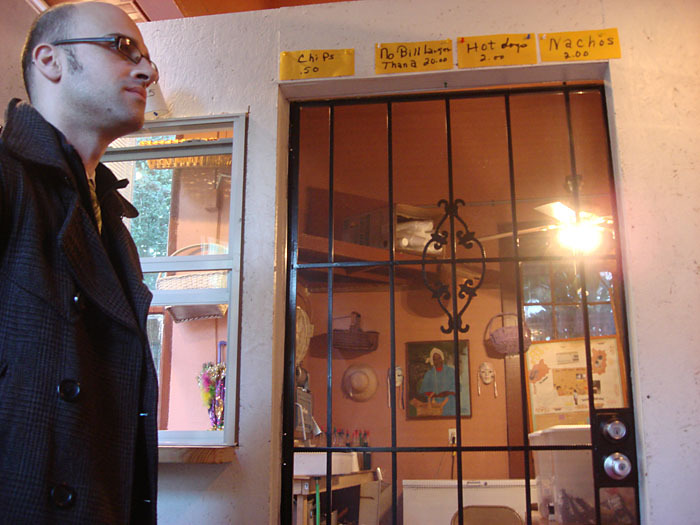 Ciprian waited patiently. He does not have much of a sweet tooth, something I cannot relate to at all. By that point we’d decided that we would just commit ourselves to spending the rest of the evening in the French Quarter. It may be touristy, but it is also magical and we knew we were going to miss it. We popped into an old bar called the Napoleon House, got a drink, discovered yet another New Yorker (the bartender), and then headed to Preservation Hall to witness the ultimate in traditional jazz. 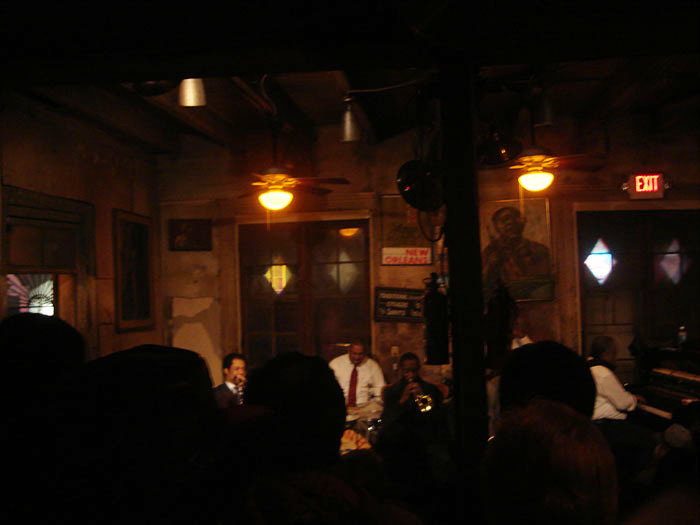 Preservation Hall is an organization dedicated to the preservation of New Orleans style jazz and some of the best musicians in the biz have been through this place. The band leader for the evening was Shannon Powell (drummer). The Hall presents several 45 minute sets every night for $10 each. That’s $10 for a band that you’d pay probably $50+ for if you saw them on tour in your own town. They are so good. And they have an incredible dynamic musically and in terms of their personalities. There were two young men, but most of the guys were over 40, and a couple were probably over 55 or even 60. But they were all amazing. 45 minutes flew by and it was so sad to leave. I strongly recommend going for at least one set if you ever go to NOLA. One last note about this experience…there is a sign on the wall behind the drummer that says: “Traditional Requests – $2.00, Other – $5.00, The Saints – $10.00.” Some of you might find that amusing. We were beginning to get a bit peckish, so we walked past a jazz place we’d been referred to (Fritzels…a Euro-style jazz joint), but decided we’d better eat first and headed down to Decatur back to the scene of our first NOLA meal – Coops. And true to our expectations, the food was exceptional and reasonably priced. 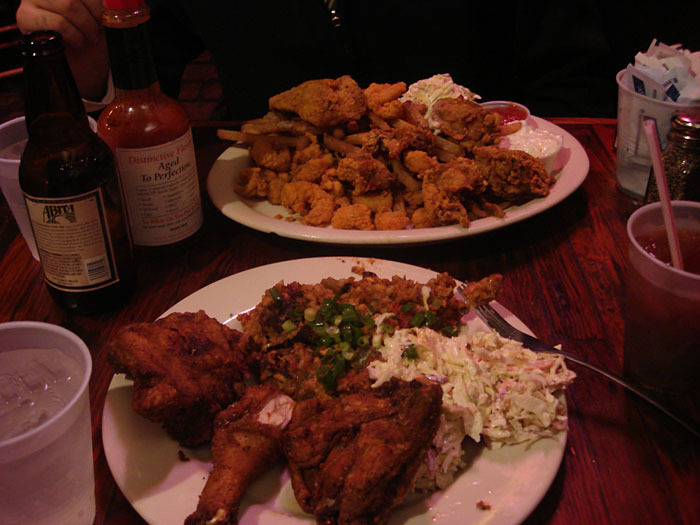 We ordered the seafood platter (fried, of course), and cajun fried chicken which comes with jambalaya (with rabbit and sausage) and coleslaw. The resident kitty cat, Stella, is seen in some of the photos I took. One kind of music that we’d really wanted to hear but had yet to experience is the Blues. There’s a tiny little music venue on Frenchmen St. called the Apple Barrel where a blues band just happened to be playing that night. The band was Ken Swartz and the Palace of Sin and man were they good. We stayed for about an hour and a half and honestly we would’ve stayed later if I hadn’t had a cold and if we were getting up early the next morning to leave. Because they were excellent. Plus, we’d met more new people! Yep, sitting at the bar…meeting local folk. The level of openness and friendliness among people was remarkable. Everyone was willing to talk, was interested and wanted to share…it was refreshing. One occasionally comes across that in NYC, but I think it’s rare. In New Orleans it is the norm. Last note…our cab driver on the way back to our B&B that night was a New Jersey native. 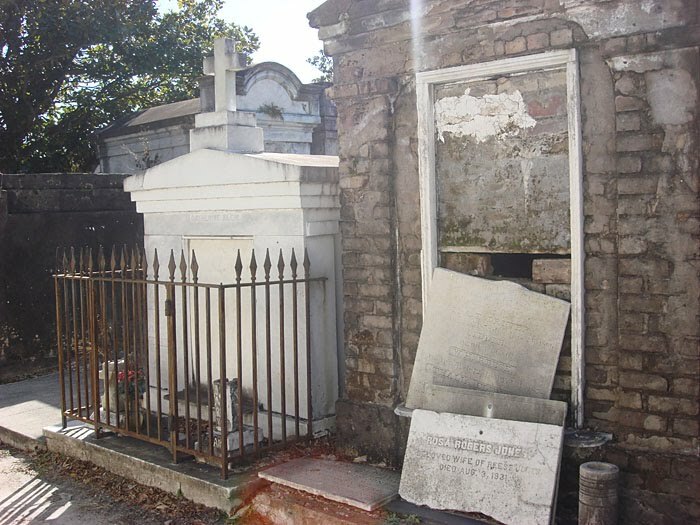 He shared a lot of the more sobering facts about living in New Orleans…such as the economic dire straits that so many people remain in, the terrible public schools, and the general neglect of the government (state and city). It was good to hear that. We’d been existing in a little bit of a bubble during our visit despite our interactions with locals and few ventures outside of the regular tourist haunts. But part of visiting a place is learning about its ugly underbelly, and every place has one. I hope New Orleans and Louisiana can get it together to support their citizens more effectively…they are an amazing group of people. We’ll most definitely be going back, hopefully soon. White Gators, Big Insects, and…the Dharma? Serendipity is my friend when I am traveling, or perhaps at any time at all, but especially when traveling. It means that I end up in completely unplanned situations that inevitably become much more memorable than any of the museums or restaurants I go to. 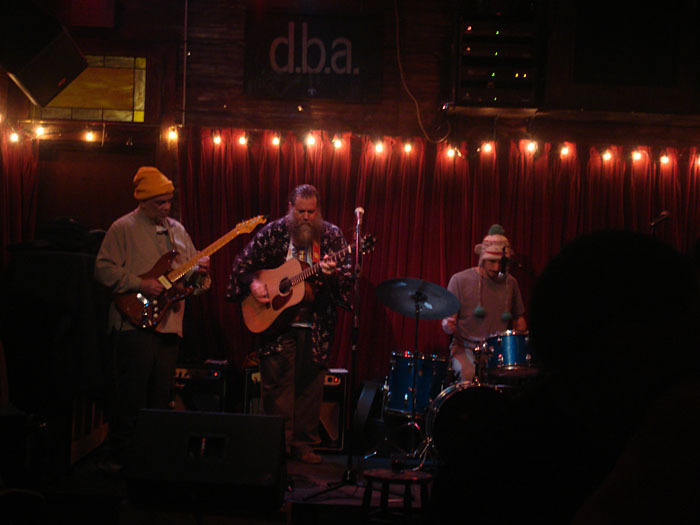 This serendipitous event began with something mentioned in my previous entry – seeing the Dharma Bums on our first night in the city at the club called d.b.a. The Dharma Bums are a Buddhist-themed pop group from Woodstock, NY. Our friend Evan played with them awhile back. They’ve been playing for years and two of the men have long salt and pepper hair and one of them has a wonderfully long beard and wears a jacket with a kind of kimono-feel to it. Comfortable in their skin and in their music would be one way to describe them. The story goes like this…C and I were at a restaurant called the Praline Connection on Frenchmen St., a creole restaurant. I had the crawfish etouffeé (that means “to smother” in french…and indeed, my crawfish was smothered with a gravy of goodness), C had the seafood platter. The food was fantastic. Another food coma ensued. Anyway, I am getting ahead of myself. When we walked into the restaurant, the Dharma Bums were there finishing up their dinner. The lead singer, Phil, recognized C from Thursday night and he invited us to a party that they were playing that night. It was a Buddhist party! 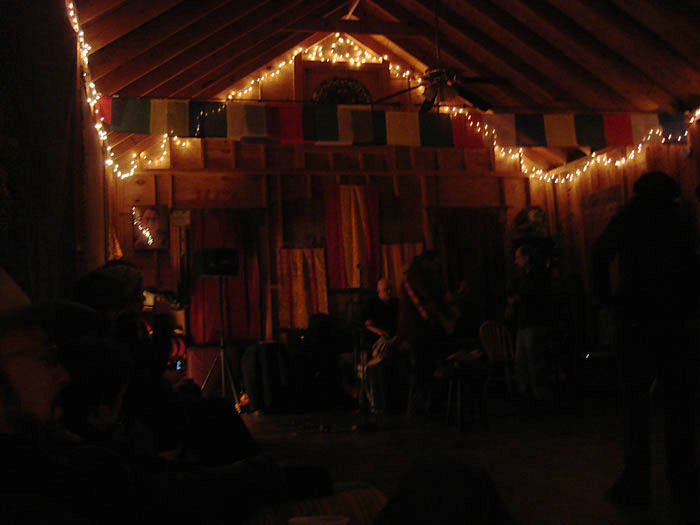 An organization called the Louisiana Himalayan Society had invited them to play the party at their community center in Mid-City. So we went of course, and not only did it get us out of the French Quarter, but it introduced us to New Orleans Buddhists which was a welcome change since we had not really talked to anyone very much since we’d been here. They were all warm and beautiful people. A lot of young, college-aged folk, but also some older people. A nice mix. They had a fire pit (bonfire) in the back yard, a keg of Abita beer, homecooked food, a king cake (Mardi Gras cake), and good company. We had a lovely time. The only downside was that it was really friggin’ cold and I started to feel the return of my cold! This damn cold just keeps flip-flopping between C and me. Ugh. But we had a wonderful time despite that. I think I have skipped an entire day here. Friday…what the heck did we do on Friday? Right. Got a late start because C wasn’t feeling well, but I took a nice stroll around the Lower Garden District and into part of the main Garden District. The houses are breathtaking. It’s incredible to me that there was a period of time where building these stunning monstrosities was the thing to do if you were stinking rich. Maybe that’s not so weird, but it’s a whole neighborhood! Pretty amazing. I guess it’s akin to areas of Florida like Marco Island where there are vast swaths of homes worth tens of millions of dollars. What else are people going to do with their money? Maybe I should leave that question alone. Anyway, here are a couple of the ones I liked best. Ciprian met me at a cafe later that afternoon, then we caught the streetcar to the French Quarter and went to Cafe du Monde, which is a super old cafe on the Mississippi River. Well, it’s separated from the river by train tracks, but it’s awfully close. It’s the original French Market café and is more than 100 years old (est. 1862). The reason for going there is not just the history, but the beignets! Yummy french doughnuts. They are little pillows of not-too-sweet dough buried in little mountains of powdered sugar. Delightful. We went to hear Ingrid Lucia for one set at d.b.a. after that, and then went for dinner at a not-very-memorable place on Decatur. It was not as good as the previous night’s fare, but it was decent. We tried to see a movie after that, but apparently New Orleanians are not big movie-goers because at the moment there is only one movie theater in New Orleans proper and it was showing two films: “It’s Complicated” and “The Breakfast Club.” Random? We decided to make it an early night. Yesterday (Saturday) was more eventful. Although it ended with the serendipitous event that started this blog entry, it began modestly with C and me walking into the CBD (Central Business District) to where several of the major museums are. We got some breakfast at a coffee shop called PJ’s and then headed to the Confederate Museum. Talk about interesting history. There were actual uniforms and weapons worn and used by Confederate soldiers. There were daguerrotype images of soldiers and their loved ones. Some of the soldiers were clearly frightened young men…it humanized them for me more than anything else. The one thing missing at the museum was a solid representation of the whole reason for the war and the perspective of the black men and women who were clearly being affected. I mean it had a bit about black men fighting in the war, but that was about it. 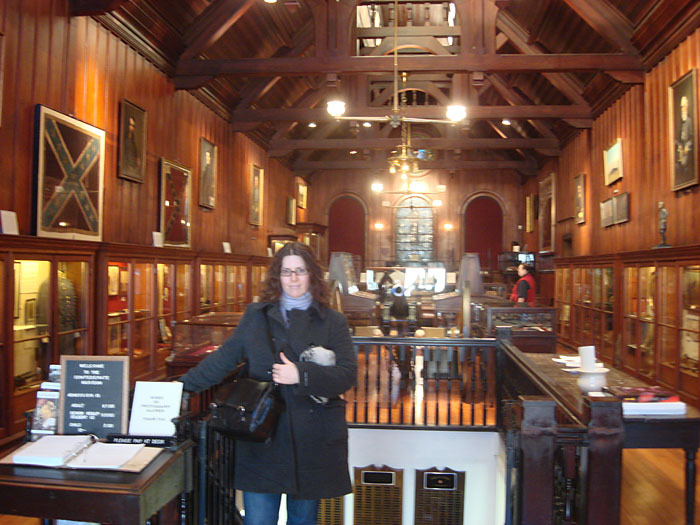 Anyway, it was very informative and we got our few dollars worth of history, but it just seemed very one-sided. We walked next door to the Odgen Museum of Southern Art after that, a beautiful little museum displaying southern art through time, with a focus on contemporary art. The Bo Bartlett exhibit was definitely the highlight. Amazing lifesize scale paintings of ordinary yet epic scenes with an almost haunting aesthetic. By that time it was getting late in the afternoon and we needed lunch. Unfortunately, the CBD does not have too many food offerings on Saturdays. So we headed to Canal Street and got tempted into an obnoxious restaurant with a name I don’t recall and ordered overpriced po-boys. They were decent, but I know for a fact that we have yet to eat really good po-boys. Anyway, we were in a hurry so we scarfed them down and walked across the street to the Audubon Insectarium where we were charmed and entertained by the wonderful critters they have inside. We saw some beautiful insects, and huge insects, some extremely tiny ones, and some that were colors I never imagined could exist in any animal but a butterfly or a bird. 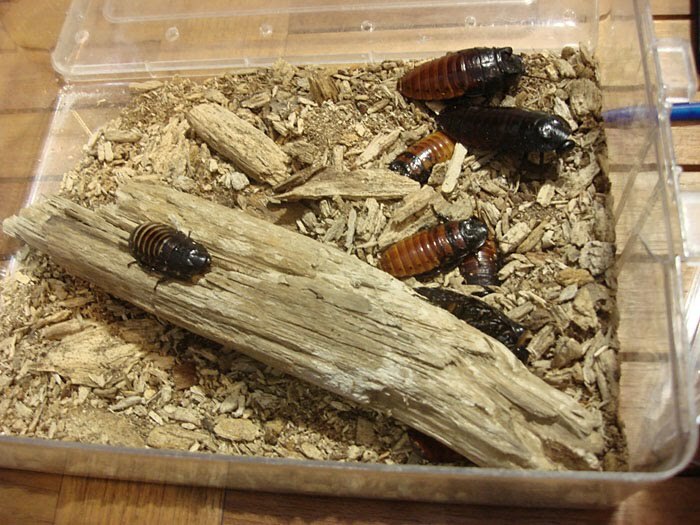 I also touched a Madagascar hissing cockroach!! Very smooth. Ciprian was brave and managed to get through the entire place without any major freak outs, although, there was a moment when I was worried about him. They have a little movie that you can watch. It’s called “Awards Night” and it’s a cartoon where they give out awards to the insects with “the best” of various features like camouflage, and there are well, things that happen to the audience during the movie that make you squirm in your seat…literally. I don’t want to spoil it for anyone who might ever visit this wonderful place, so I will keep the details to myself. 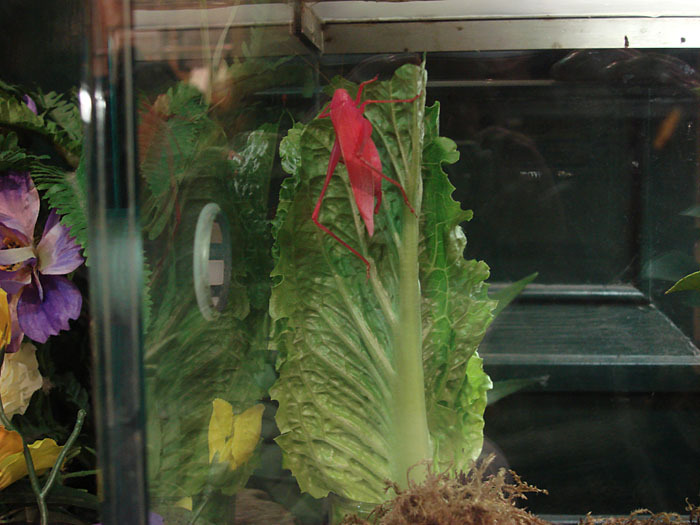 My favorite part of the Insectarium was the Louisiana Swamp exhibit. They had two white baby alligators. Yes…white and babies! I was completely and utterly charmed by these little guys and really could have just hung out there for a good long time. But we had to leave because the place was closing. After that we eventually made it to the Praline Connection and to the story I mentioned first. Today was a mellow day since now I am not feeling well. We slept in and got brunch at a hip breakfast place called Surrey’s. It’s on Magazine and Euterpe in the Lower Garden, just a few blocks from where we’re staying. Best biscuits I’ve ever had. We went to the French Quarter today and hit a couple of the smaller museums – the Presbytère which holds the Mardi Gras Museum and then the VooDoo Museum. Both were a lot of fun. The Mardi Gras museum was kind of amazing. Having never been to Mardi Gras, it’s difficult for me to understand the vast industry and deep-set culture of Mardi Gras and the surrounding season. It is pervasive. As an example, at this time of year in most parts of the country retail establishments tear down their Xmas decor and sales items and start preparing for Valentine’s Day. In New Orleans, no one seems to prep for V Day, but rather they begin to prep for Mardi Gras. The season just started and will last until the actual day of Mardi Gras, I believe. Ciprian is urging me to get off the computer, so I’d better go. 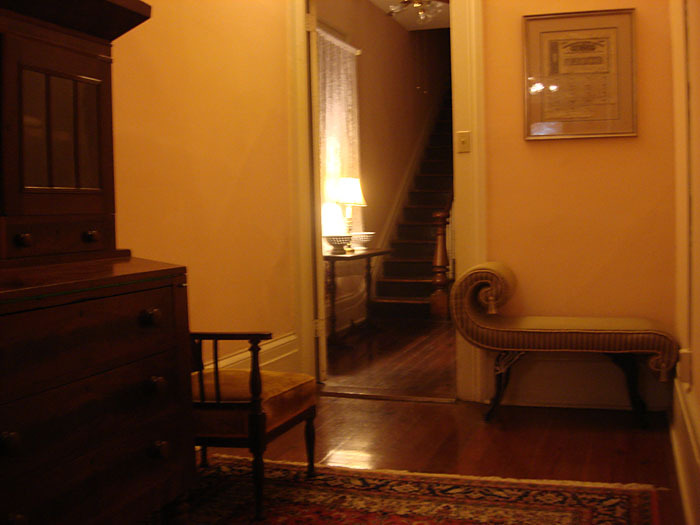 I am sitting on the bed in our room at the Fairchild Bed and Breakfast on Prytania St. in the Lower Garden District, with the heater on. Yes, it is freezing here in the south, but the sun is out which is a damn sight better than yesterday which was drizzly and cold. The only real negative is that Ciprian is sick. We’ve both been a bit sick over the last few days but he woke up with a little fever. That kind of put a damper on things, but I told him that the trick is to be defiant. Take good care of yourself but have the attitude that you refuse to be sick. This gets the adrenaline up (or that’s the idea), which is good for boosting the immune system (I think) and ultimately makes you all better. This is my strategy when I’m sick and it usually works. In the meantime we’re having fun anyway. We arrived yesterday afternoon after a very nice Continental flight. They even gave us a little snacky sandwich; a surprise in this era of no-frills air travel. We took public transit from the airport to our B&B. The E-2 bus on Jefferson Transit (so named for the parish west of Orleans parish…maybe “Parish” should be capitalized?) took us all the way to the CBD (Central Business District) in downtown New Orleans. The CBD used to be the American Quarter after the Louisiana Purchase when a bunch of Americans started moving in on this historically French and Spanish city. It borders the French Quarter at Canal Street. Canal is a wide street with a median. 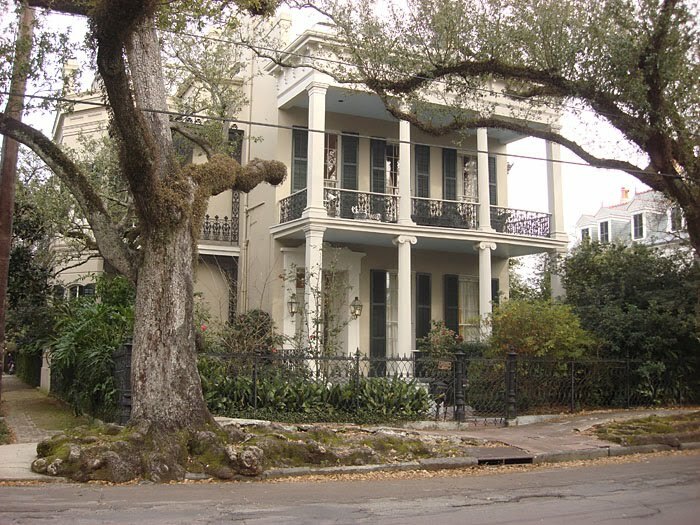 That median used to be known as “neutral ground” between the American and French Quarters. I gather they did not get on too well. Supposedly all medians are now nicknamed “neutral ground”, although I have not yet heard a New Orleanian call them that. Then again I’ve been here less than 24 hours. So our bus dropped us at the corner of Tulane and Elk in the CBD and we walked a few blocks down Canal to the famed St. Charles Avenue streetcar. I’ve taken this before – the last time I was in this city in 2001. It is the oldest continuously-operating streetcar in the world, operating since 1835. 1835! It’s a charming and nicely laid-back experience to ride the streetcar. And it’s only $1.25, so it’s a deal. 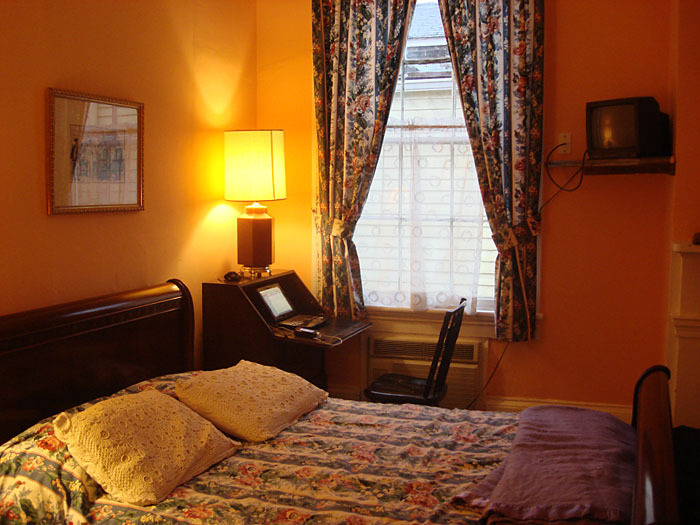 We took the streetcar to Melpomene street, got out and walked about a block and a half in the drizzle to Prytania, and there was our lovely B&B. 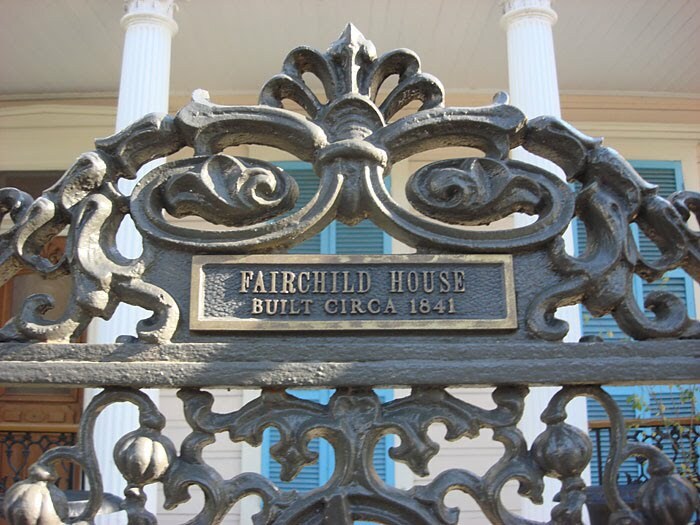 The Fairchild House is actually two houses, built in 1841. It was a plantation. Both houses have columns out front. I’ll try to take a photo and stick it in here later today or tomorrow. One of the two houses has an old stable attached which over the years was converted to living quarters and now serves as the breakfast area. The innkeeper is a lovely woman named Beatriz. She and her family are originally from Brazil but they moved here when she was a child and so she has now lived in New Orleans for most of her life. 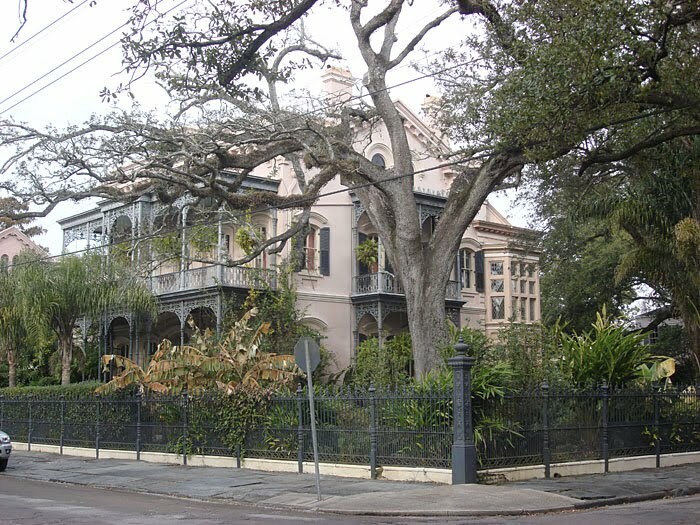 New Orleans has this reputation, as I understand it, for being a place where people stay. San Francisco also has this reputation. What I mean is, people who grow up here (or there) often stick around because the quality of life is good and at least in the case of New Orleans, the culture and community are so rich and diverse. This is one of the reasons I fell in love with this city back in 2001 and it still has the same magic today. We could feel it immediately when we arrived. Last night we took the streetcar back to Canal and wandered through the French Quarter a bit. Ciprian finally understood why Bourbon St. has a reputation for debauchery. There are strip clubs and bars galore and the street is peppered here and there with the occasional moderately high-priced restaurant serving up oysters and various creole and cajun specialties. 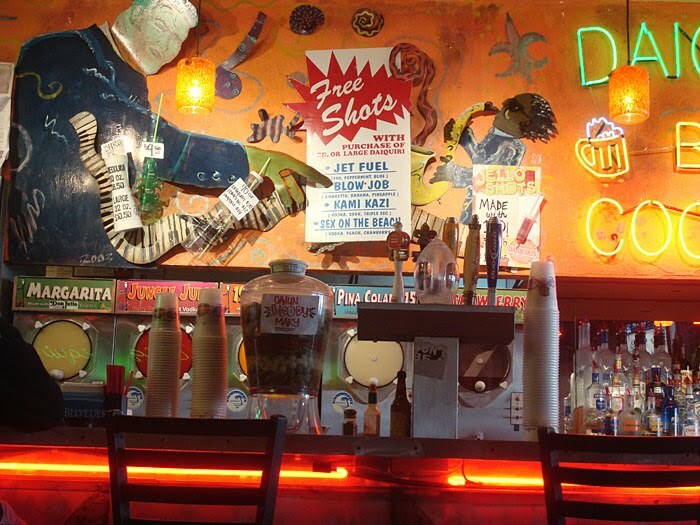 A couple of doors down you might find a place that looks like a hotdog stand or a futuristic ice cream parlor, but which serves daquiries and hurricanes and has mardi gras beads and masks draped about as decor. We wandered down to Decatur St., which is closer to the river, looking for a place to eat. The goal was: local, good, cheap. 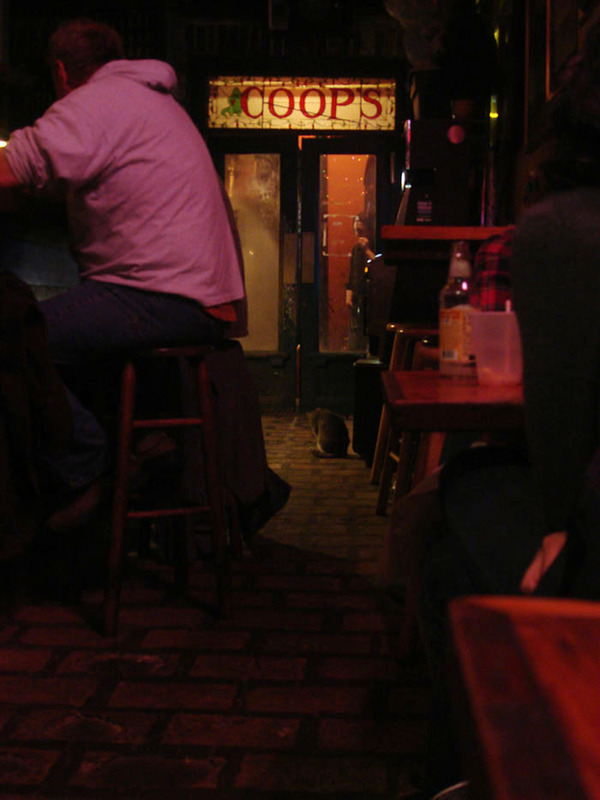 I’d been told about a place called Coops and that was really what we were looking for, but we walked and walked and couldn’t find it. Then at one point we were about to turn around when a young man said, “hey, are you looking for someplace to eat?” And we said “yes, something good and cheap.” He said, “Well, you should try Coops.” “Oh my god!” I said, “That’s the place we were looking for!” So he directed us. Turned out we were only a block away. Lucky that guy found us. For dinner, I ordered the Coops Taste Plate which came with a cup of seafood gumbo (fantastic), followed by a plate piled with several of the NOLA classics (oh…quick note…I decided to abandon my “no mammals” rule while here…there’s just too much good stuff to eat): shrimp creole, red beans and rice, fried chicken (best I’ve had in my life, hands down), and rabbit and sausage jambalaya, which apart from the chicken was probably my favorite food on the plate. Ciprian got the fried shrimp and oyster platter. I reached the food coma state pretty quickly, but then I got a second wind and we managed to clean up most of the food between the two of us. We also had some excellent local beers. Abita is the name of the popular Louisiana brewery. We had the Restoration ale, a kind of pale ale. 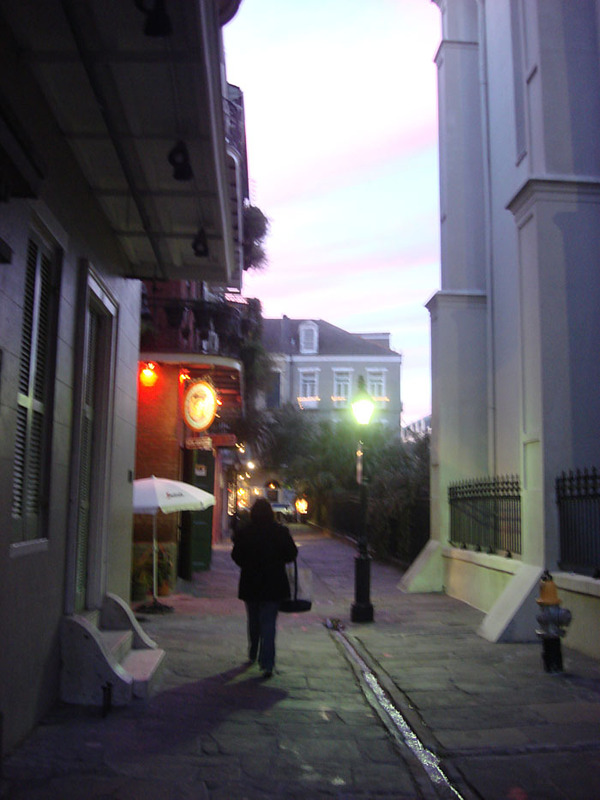 Later in the evening we walked to Frenchmen St., which is across Esplanade Ave, the eastern border of the French Quarter and it’s where the Faubourg Marigny neighborhood begins. 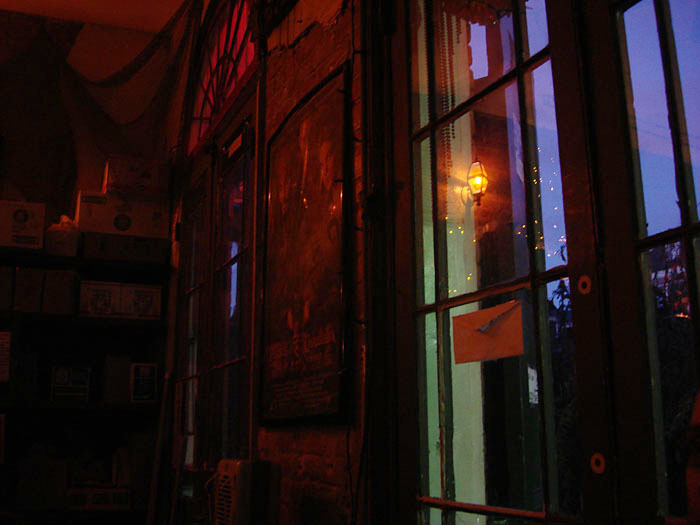 Frenchmen is kind of the Williamsburg of NOLA from what I gather. It’s small, but has some excellent jazz clubs and hangouts. 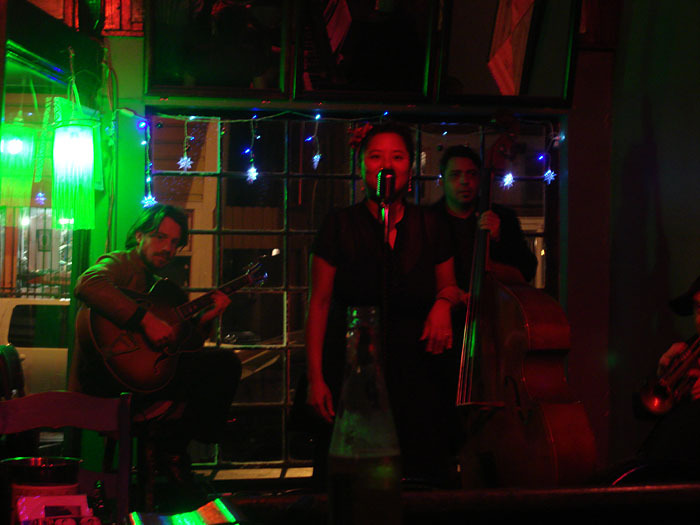 We wandered into the Spotted Cat where a young woman named Sophie Lee was singing jazz standards with her band (upright bass, hollow-body guitar, piano, trumpet). Note how much her guitar player looks like Robert Downey Jr.
We stayed for about a set and a half, then went across the street to d.b.a. and caught the tail-end of a solo piano set, a la Allen Toussaint. I didn’t catch the performer’s name, but he was quite a hit with the crowd. The last act of the night was a band from Woodstock, NY, oddly enough, and perhaps even more serendipitous was that they were called the Dharma Bums. They sing about Buddhism! And, to add to the coincidence, it turns out that Ciprian and Evan had seen them play about 10 years ago AND Evan knows the lead singer. So Ciprian went up to him after the first set and said hello. Crazy fun night. At that point it was about 11:30pm and we were wiped since we’d gotten very little sleep the night before, so we grabbed a taxi and headed back to our lovely room and crashed. This morning I had breakfast and met one of the other guests at the B&B. Did not catch her name, but she’s a fascinating woman; retired engineer, now taking science classes for fun. We talked about science and feminism and just enjoyed each others company. That’s the best part of a B&B; meeting people. It is now almost 1pm and I need to get out and about. Ciprian will be lagging behind me this morning, but that’s okay. I’ll go explore the neighborhood and maybe find a place where I can get a haircut. I just made my packing list. I am slightly obsessive about packing lists. I know that if I do not make them, I will forget something. Probably something not very important, but it will drive me a bit nutty so I make the list. I think it’s a healthy obsession…if there is such a thing. My other list, the list of music to see (to hear and see) while in New Orleans, is short and very open to change. It includes, however, one Ingrid Lucia formerly (or maybe currently?) of the Flying Neutrinos. She’s a jazz singer…she performs a kind of paired-down bluesy, New Orleans-flavored jazz with a hint of dixieland and swing thrown in for extra texture. 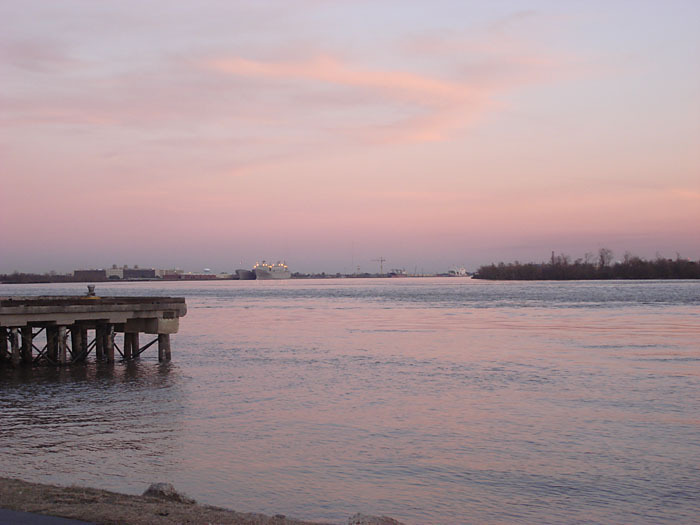 We saw her in NOLA in 2001 at the Old Point Bar at Algiers Point. That visit to NOLA was with my boyfriend at the time, Mike. We were there for JazzFest. A very good reason to visit. But this time there is no special event, no big festival or parade. Just my lovely man and I spending a week in the Crescent City doing nothing in particular, hearing good music, eating good food and enjoying ourselves. Before we leave I have things to do of course. And currently I am doing none of them because I am spending far too much time customizing this blog. Such is life. More in a few days…when my belly is full of gumbo.